It was just 2 months ago that we said goodbye to one of our pet rats, Jack. Unfortunately, here I am again with more sad news. Now, little Gus has also passed away too. He's flying free with his brother. Gus has exhibited some typical signs of old age for several months, but he always astonished me with how well he was able to get around. It seemed like nothing really slowed him down. Gus's passing was somewhat unexpected. I mean, I knew his time was limited because he was elderly but he didn't give me much warning before he passed. Very late Friday night, I went to give him his late night dinner like I usually do. At first, I couldn't find him in his cage and he didn't come to greet me. I found him nestled up in a corner, picked him up, and put him near his plate of food. He showed absolutely no interest in it, and just laid his head near it. That was quite alarming, because he has always been happy to eat his meals up until this particular moment. I grabbed some vegetable baby food from the pantry and decided to syringe feed him. He still showed no interest. After some coaxing, I did get him to lick a very small amount of the baby food up. I decided to fix him a place to sleep for the night in the cat carrier. That way he couldn't climb the ramps in his cage and fall down or something. The time Gus wrote poetry. I'm glad that I was able to be there with him during his last moments. I was hoping he would make it to his 2nd Gotcha Day next month. He almost did, but not quite. Gus was 2 years and 8 months old. He lived with me for almost 2 years. It's been raining this weekend, so Gus will have a little funeral when it finally stops. We'll bury him next to his brother. Rest in peace little Gus. Say hello to your brother for me. Oh Miss Ann, we are so sorry for the loss of Gus. He was such a cutie! For some reason, we though rats lived longer than 2-3 years...shows how much we know about our little rodent friends. So glad you were there with him when he left. Run free sweet Gus, run free. Very sorry for your loss. The video was a wonderful tribute. So sorry for the loss of sweet Gus. Dang. We're all so sorry to hear about dear Gus. Those two always made us smile. We know the dynamic duo will be romping free together again. Love ya Gus. We're so sorry. But the thought of Gus and Jack playing together again brings some comfort. Mom Kim here - so sorry for your loss of sweet Gus. He did have a sweet little face and I loved all the pictures and the video of him. It is obvious he was well cared for and much loved. It may be hard for us to be with our furry companions when they pass but it is truly the best and final act of love we can give them. So sorry to hear this Ann, been following you for a long time and Gus was always one of our favorites! I hope he's at peace now and our thoughts are with you at this difficult time! So sorry for your loss. I know how hard it is after a pet passes. RIP Gus. I am very sorry for your loss. He was a cutie. We are very sorry to hear this news. We know little Gus had a wonderful life with you. So sorry to hear about Gus. They both had such a short time with you which is so very sad. So sorry to hear about Gus. I can't believe my boys are both gone now. I really learned so much about them through your blog. Thank you so much for sharing them with me/us. Ann, we are so sorry to hear that Gus was needed at the Bridge. Thank you for loving him so much, and so well. Hugs, purrs and prayers to you and your family. 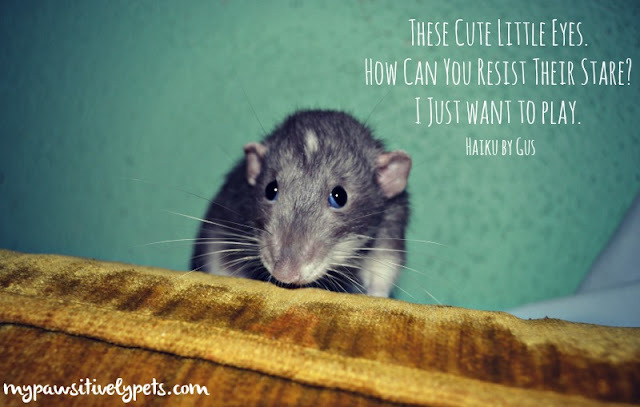 i am not fond of rats either. in fact, my 3 mini schauzers would go after them. Tressa is fast. she has caught several field mice in the house. i am so sorry for your loss. maybe he was lonely for his brother. i gather rats do not live a long time. at least you were with him during his last hours and he felt your love as he passed over. they are very cute pictures. i know that in the local pet supplies plus store, one of the clerks brings in her pet rat and he hangs out around her neck during the day. i was so surprised the first time i so something moving around her neck. he was potty trained too. nice video. that is nice of you to give him a funeral and burial. Reading this post and the one about Jack passing brought tears to my eyes. I'm sure they couldn't have lived better lives with any other human than you. Oh honey I am so sorry to hear about Gus. 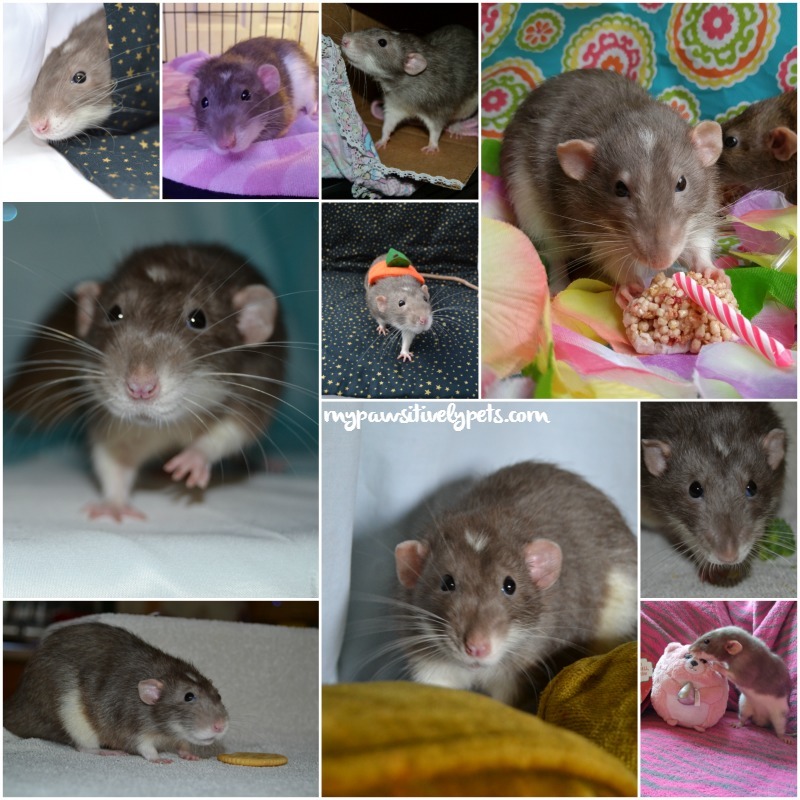 I too have two elderly rats and cherish every day with them well knowing whats coming.One is my heart rat. One is a breeder and one is a pet store. I love them so much. My prayers are with you and yes hes is somewhere happy hanging out with his brother.